Lemax E12 Replacement 12v Bulbs Accessory (Set of 2) genuine Lemax Village screw-fitment 3 Watt filament lamps compatible with older light units for Lemax Buildings. 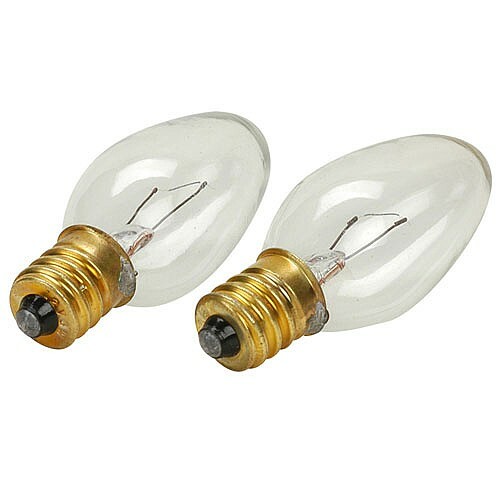 Clear glass 12 Volt bulbs specially designed to fit lightcord lamp units for non LED Lemax Porcelain Lighted Houses. Brass screw fitting makes swapping blown filament bulbs a comletely safe and easy task for any Lemax collector. Lemax buildings come to life when illuminated using Lemax lightcords. Modern Lemax lighted buildings utilise LED lighting technology, but these E12 replacement bulbs enable Lemax collectors to continue the use of older lightcords.